Svasti is an equal employment opportunity company and is committed to creating a healthy working environment that enables employees to work without fear of prejudice, Gender Bias and Sexual Harassment. The Company also believes that all employees of the Company have the right to be treated with dignity. Sexual harassment at the work place or other than the work place if involving employees is a grave offence and is therefore, punishable, both under the policies of the company as well as under applicable laws. Svasti endeavors to ensure a Safe, Secure, Friendly and Healthy work environment so that employees can deliver their best without any kind of inhibition. Sexual harassment is a serious offence that can destroy human dignity and violates the right to gender equality. It is an act amounting to misconduct in employment. 1.2.1 Sexual harassment is unlawful. Svasti does not tolerate sexual harassment in any form. Every volunteer, staff member and supervisor has a responsibility to ensure that sexual harassment does not occur. 1.2.2 Anyone found to have sexually harassed another person will be subject to disciplinary action that may include an apology, counseling, transfer of duties or dismissal. 1.2.3 Reports of sexual harassment will be treated promptly, seriously and confidentially. Complainants have the right to determine how a complaint will be treated. They also have the right to have a supporter or representative chosen by them involved in the process and the option to stop the process at any time. 1.2.4 The alleged harasser also has the right to have a supporter or representative chosen by them present when he/she responds to the allegations made. 1.2.5 No volunteer or paid staff member will be treated unfairly as a result of making a complaint of sexual harassment. Immediate disciplinary action will be taken against anyone who victimizes or retaliates against someone who has made a complaint of sexual harassment. Svasti will follow natural justice to any person involved in a dispute. Sexual harassment in the workplace has been defined as unwelcome sexually determined behaviour, whether directly or indirectly. 1.3.1 Unwelcome sexual advances, requests or demand for sexual favours, either explicitly or implicitly, in return for employment, promotion, examination or evaluation of a person towards any company activity. 1.3.7 It could be directed at either males or females. 1.3.8 Any other act that may fall within the definition of sexual harassment under the applicable laws. Svasti follows a zero-tolerance policy on such matters. 1.4.1 If comfortable to do so, inform the alleged harasser the behaviour is offensive, unwelcome, against the organization’s policy and should stop the same immediately. 1.4.2 Make a note of the date, time and location of the incident/s. 1.4.3 If not comfortable to confront the alleged harasser or if unwelcome behaviour continues, report to the nominated sexual harassment committee contact. 1.4.4 If this is inappropriate, speak to another senior member of the organization, the head of the organization or a member of the board. The sexual harassment contact will follow the procedures set out below. At any time, the complainant has the right to discontinue this process. 1.5.1 Obtain and record a full, step-by-step account of the incident/s. 1.5.2 Ensure the organization’s process for handling the complaint is understood. 1.5.3 Ascertain the complainant’s preferred outcome, e.g. an apology, the behaviour to cease, a change in working arrangements. 1.5.4 Agree on the next step: informal resolution or formal investigation. 1.5.5 Keep a confidential record of all details of this discussion and subsequent steps in the process. 1.6.1 Inform the alleged harasser of the complaint and provide an opportunity to respond. 1.6.2 Ensure both parties understand their rights and responsibilities under the organization’s policy. 1.6.3 If possible, mediate an outcome that is satisfactory for the complainant. 1.6.4 Ensure that confidentiality is maintained. 1.6.5 Follow up to ensure the behaviour does not re-occur. 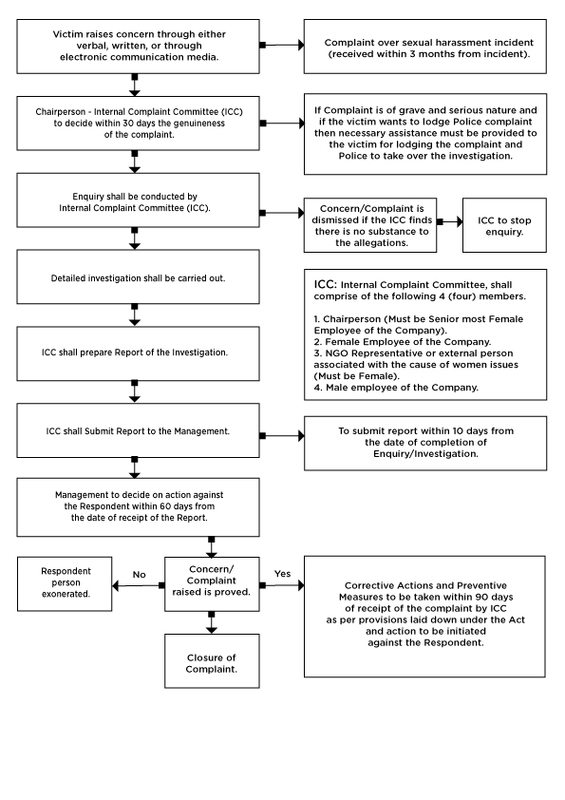 Process flow-chart for complaint handling under Sexual Harassment of Women at Workplace (PPR) Act, 2013. Svasti has a Sexual Harassment Committee to take up and enquire against any sexual harassment and gender discrimination cases. Employees may call or email any one of the following Committee Member of the company to register a complaint under this policy. At Svasti, we believe that the right to finance is a fundamental right of all human beings. We create products and services for different types of needs, and all kinds of people, including for those who don’t have collateral to cover the risk of the loan provided. Note: Data of Employees, Branches, Customers, and Portfolio in INR Crores, is as of 5th April 2019.